Hi. I’m Micah Shilanski from Plan Your Federal Retirement. Welcome to our video. We just finished teaching two days of federal benefits classes. They were eight hours a day, and we had a lot of great questions that came up, so we thought we’d share one of those with you. They sound similar, but they have really big differences in retirement times. Let’s learn about the deferred retirement first. What is a deferred retirement? Well, in order to retire under the FERS, Federal Employee Retirement System, you’ve had to meet one of three criteria. You’ve had to be at your minimum retirement age, (MRA) and have 30 years of creditable service; be age 60 and have 20 years of creditable service; or be age 62 and have at least 5 years of creditable service. Those are our requirements that we have to meet in order to retire with an immediate, unreduced pension. Let’s say I work with the Feds, I’m 50 years young, and I’m done. I want to separate. 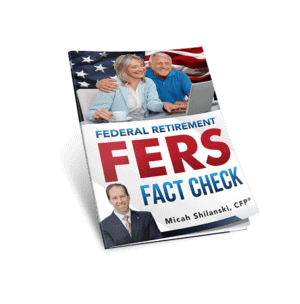 I’ve had 20 years of federal service, so I’ve paid into the FERS system and I’m vested. Vested for FERS employees means that they have paid into the FERS Pension plan for five years of more. My pension is vested, so I could defer my retirement. I could separate from the Feds, I could go to the private sector, could do whatever I want, and I am deferring my pension to a future time. OPM would process your paperwork and start your pension, which is great! You do not lose your pension when you defer, you stop contributing to the pension but you do not lose it in this scenario. I still had my pension benefit, I just deferred it. In this scenario, I lost another great benefit, FEHB. Probably the best benefit you have as a federal employee is your Federal Employee Health Benefit, your insurance. Under a deferred retirement, you do not keep health insurance into retirement. Let’s take a look at a postponed retirement, and this is a big difference. How does a postponed retirement work? A postponed retirement means I am eligible for an immediate pension right away, but it has a penalty. I want to postpone receiving my pension so that I do not get a penalty. I could be Minimum Retirement Age (MRA – around age 55 and 57 contingent on when you were born) and have 10 years of federal service. In this scenario, I am eligible for an early retirement, with a penalty. The penalty is because I do not have my 30 years of credible service at the MRA. Therefore, I have to pay a 5% penalty every year that I am under age 62. Let’s apply this to a scenario. Let’s say that I am 57 years young and that I have 10 years of credible service with the feds and I chose to separate. If I turn my pension on right away, and I would be able to, I would be at a 5% penalty for the 5 years (62 minus 57 = 5 years) that I am under 62. 5 years X 5% = 25% Permanent Penalty that never goes away in your retirement. Maybe I do not want to do this? Maybe what I want to do is chose to postpone my benefits. I could go and put them on a shelf and come back at a later time. Well, when? I have ten years of service. That means I’ve had to be at least 62. At 62 I could go back to the OPM, I could turn on my pension and my FEHB, Federal Employee Health Benefits, which what makes a postponed retirement attractive. Now, I had to stop getting health insurance if I chose not to get that pension at 57 for that MRA and 10 retirement, and I postponed it, but now I’m 62. When your pension comes on and your get your FEBH back the government keeps paying their approximate 72% of the FEHB premium and you have to continue to pay the 28% (just like most feds do now as an active employee). What I like about this is that it gives you options as a federal employee. It makes it more flexible so you can choose the right plan that meets your financial needs. My name is Micah Shilanski. I hope this information has been of benefit to you. Please go ahead and check out more information on our website, plan-your-federalretirement.com.